This week I have some works in progress to show you - one of which has unleashed a little addiction to bead knitting! 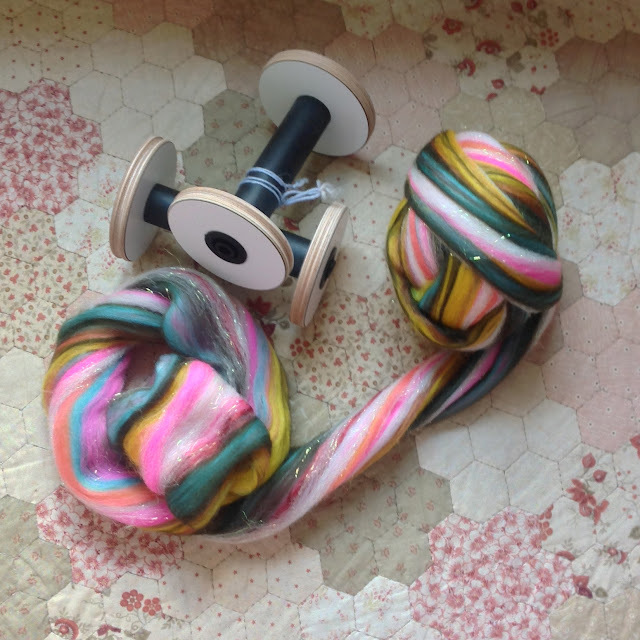 I have two finished objects, some spinning and I have some very lovely things to show you. Sock Scraps Blanket - I have added a few squares but will be putting my blanket away for a bit while I work on some other projects. I explained a little about how I put in my contrast heel - thank you for the question Okielynn. I am adding beads to my shawl which I got from Bead Stampede. I have also been recommended Crystals and Ice and GJ Beads. Here is a link to the fantastic tutorial from Kristin of the Yarngasm podcast just in case you haven't seen it yet. I have finished the Felt Studio UK Superwash Merino and Nylon with Sparkle braid - it will hopefully become socks soon.